We’re already two-thirds into the year 2014, but for a brief moment Thursday night at the Best Buy Theater it was 1984 all over again when the Retro Futura tour made a stop in the Big Apple. For an audience now in their 40s and 50s, it was a moment to bask in the nostalgia of their ’80s New Wave youth as some of the preeminent acts of the Second British Invasion performed their greatest hits—among them Tom Bailey, formerly of the Thompson Twins; Howard Jones; Ultravox’s Midge Ure; China Crisis; and Katrina, formerly of Katrina and the Waves. Definitely the biggest highlight of the four-hour evening was the return of Tom Bailey to the stage as it had been about 27 years since the Thompson Twins performed live. Since the band’s dissolution, Bailey sort of kept a low profile other than being involved in other projects. So it was kind of a big surprise when it was announced that he was one of the co-headliners for this edition of this tour. And honestly, he didn’t disappoint as he was the last act to perform on the bill. Accompanied by an all-female backing band, Bailey rolled out a good plenty of the Thompson Twins’ famous hits: “Lies,” “You Take Me Up,” “Doctor Doctor,” “In the Name of Love,” “Love on Your Side,” “If You Were Here,” “Sisters of Mercy,” a lovely reworking of “King for a Day,” and the set closer “Hold Me Now.” Decked out in shades, Bailey still had the vocal chops and displayed the percussion skills that was an integral part of the Thompson Twins’ eclectic sound. Hopefully this return for Bailey won’t be just a one-time thing because despite the long hiatus, he hadn’t lost a step. 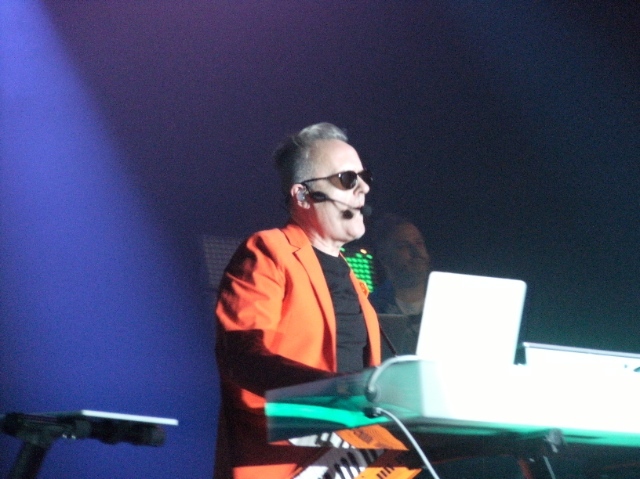 The other co-headliner of that evening was Howard Jones – and there’s a bit of history for me personally with the artist: he was the first-ever concert performer I saw at the now-defunct Academy in 1993. Certainly while his music is obviously synthesizer-oriented, Jones didn’t spend the entire set behind the keyboards. Wearing an orange-reddish outfit, he was a flashy showman who walked around the stage with his keytar and engaged with the audience as if it was a stadium gig. Pretty much all the memorable HoJo songs were performed: “New Song,” “The Prisoner,” “Everlasting Love,” “Like to Get to Know You Well,” “No One Is to Blame,” “What Is Love,” and “Things Can Only Get Better.” There were also interesting touches – at the end of one of the songs (maybe “Everlasting Love”? ), he kind of jammed where it was like a hybrid of Stevie Wonder/Billy Preston and hi-NRG music. 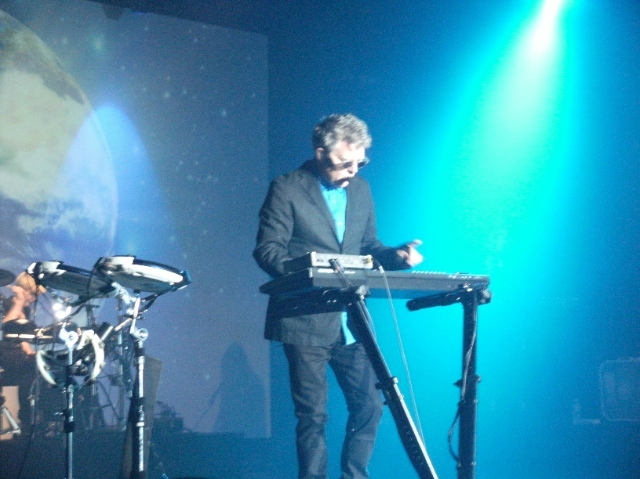 Jones is the antithesis of synthesizer-driven music being perceived at times detached and cold, as both his music and lyrics tend to be upbeat, which was undoubtedly the case during his set. 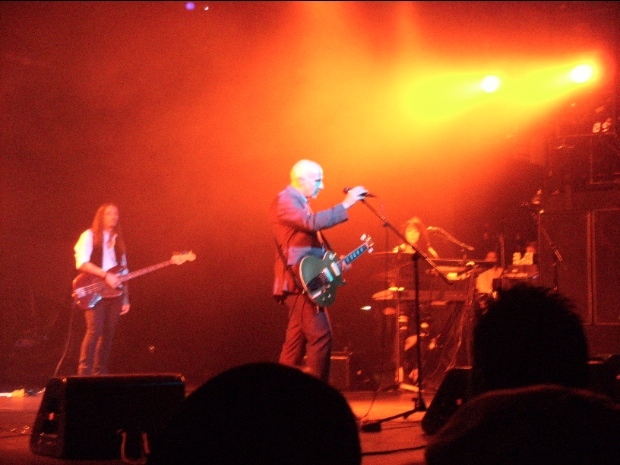 As far as delivering the rock and roll passion, Midge Ure won hands down during his middle slot earlier in the evening. The Ultravox frontman, who just released a solid new record called Fragile, played material from both his band and solo years: “Hymn,” “Dear God,” “If I Was,” “Dancing With Tears in My Eyes,” and the classic ’80s anthem “Vienna.” Ure also performed his version of the pioneering electropop hit “Fade to Grey,” going back to his days as a member of Visage. Too bad the strong set wasn’t longer—if that’s just a fraction of a typical Ure show, then one could only imagine what the full experience is like. The audience at the Best Buy have grown older since the heyday of the Second British Invasion and don’t necessarily have the ’80s big hair and wardrobe from their high school and college years. 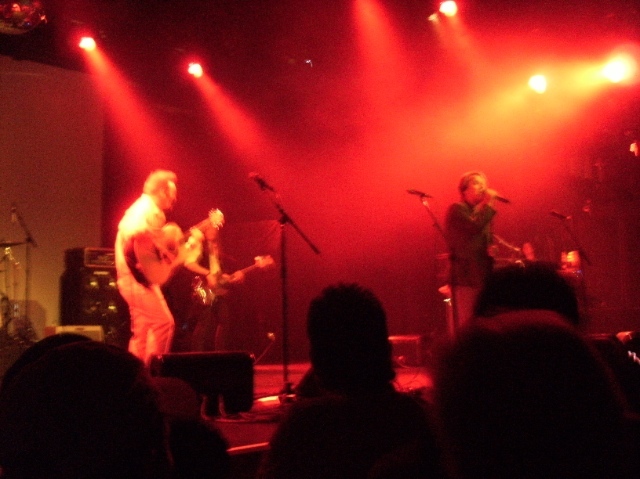 But their enthusiasm to see their heroes play the greatest hits (it was definitely not an evening to hear the occasional “new” song, and none of the acts I’ve seen dared to bring it up in their sets) was quite evident in their cheers and applause. I even spotted one guy who appeared to be in his 50s/60s wearing a Thompson Twins T-shirt. It’s proof that for a musical period that often doesn’t get appreciated enough and tends to be maligned is still alive through these artists and within the hearts of true fans.